With every new school year comes the tradition of back-to-school shopping. Once upon a time, it was a much-anticipated event, something kids and parents looked forward to. These days, between long lines and impersonal environments, it can be more of a chore than anything else. That’s where Fayetteville’s Smith & Davis Clothing comes into play. Locally owned and operated for more than 50 years, this one-of-a-kind shop is committed to making shopping for back-to-school outfits not just painless, but fun. “This will be our fifty-second year helping Fayette’s families get ready to go back to school,” says owner Tony Davis. “We’re just as excited as we were in year one.” Fifty years ago, back-to-school shopping was simple. Families came in, picked up five pairs of jeans (available in one color), a few shirts, some socks and shoes, and maybe a belt or other accessory for each kid. Today, students have far more options to choose from – and the shift in school year-timing means they often start out in shorts, fashion tees, and sandals, then come looking for jeans and other items later in the year. Smith & Davis has always been about stocking the brands kids want so parents don’t have to drive all over town to get the job done. Sales Associates Austen Clarke and Charles Evans. 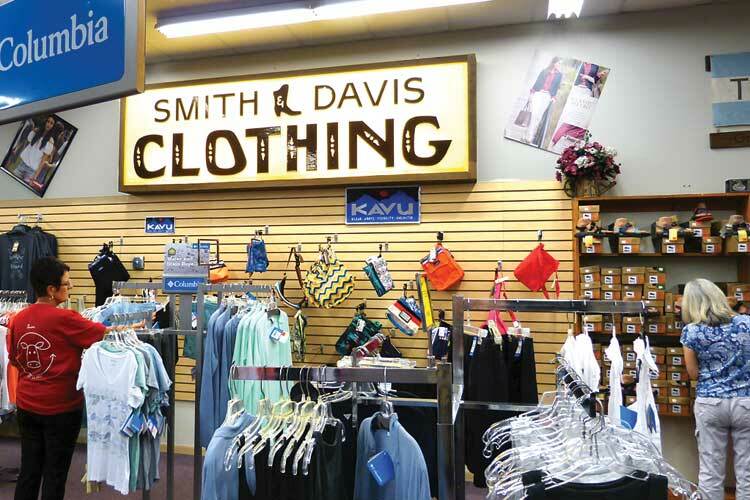 Smith & Davis’ in-demand brands don’t stop at clothes, either. 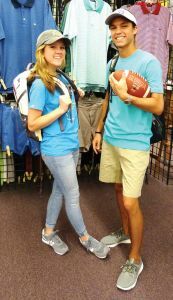 They also carry back packs, rope bags, wallets, and more by Sak Roots, Kavu, Patagonia, and North Face, along with shoes like Birkenstocks, Chacos, Sperry, and Tom’s. Speaking of shoes, back-to-school means back to sports for lots of kids (and often the parents who have time to get back to their own exercise routines). The shop carries everything athletic, from exercise clothes and accessories to an incredible assortment of performance athletic shoes by brands like Nike, Saucony, New Balance, Asics, and more. Plus, they offer full fitting services and consultations designed to help choose the best shoes for the customer’s needs. “The right shoes can make a huge difference in your life and your athletic performance,” Tony says. “And when you’re dealing with growing kids, sizes and needs can change in just a short amount of time. Our shoe staff is fully trained to provide accurate measurements and fit recommendations that can keep you and your kids healthier and more active.” This service is just one example of a well-known fact about Smith & Davis: while Tony Davis and his staff have seen lots of styles come and go over the years, the store’s absolute commitment to personal service has never wavered.